Located in the northwestern part of Chennai, Korattur is slowly becoming one of the best areas for real estate. It has developed from a small village to an urban township in the last few years. Korattur is a part of the Ambattur Zone of the Chennai City Corporation and is a stone’s throw away from Anna Nagar. 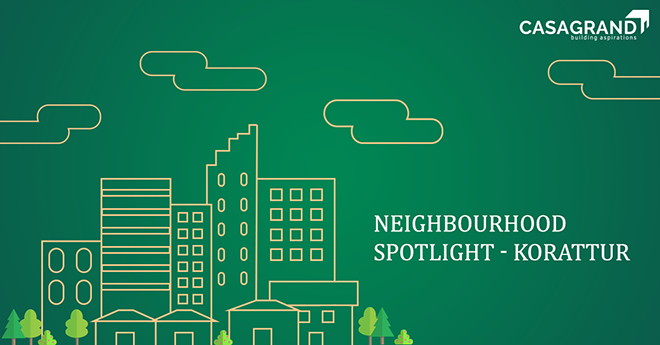 The area has seen a lot of large-scale development in terms of infrastructure and many residential projects have also come up in this neighbourhood to cater to the growing number of people moving here. Read on to see why Korattur is the ideal neighbourhood. Additionally, the locality is also close to Anna Nagar, which has some of the happening restaurants in the city. The public transport systems in Korattur ensure that commuting to and from the area is very easy and smooth. Korattur has its own suburban railway station that is well-connected to several important areas in Chennai. The EMU trains which run on the Chennai Central-Avadi/Arrakonam railway route stop at Korattur Railway Station. Korattur also has a good public bus service with frequent buses running through the area. The MTC bus service provides excellent connectivity between Korattur and other areas of Chennai like Padi, Ambattur OT, T. Nagar, Tambaram, Parry’s Corner, etc. Residents living in Korattur have every convenience they could possibly need right at their fingertips. There are a number of large grocery stores in Korattur that have fresh produce and well-stocked shelves. Some of the biggest supermarkets in Korattur include Nilgiris, Annachi Super Market, Rajguru Stores and Golden Stores. Popular salons like Naturals and Green Trends have opened up in Korattur to cater to the residents living here. There are also a large number of banks and ATMs in Korattur like Indian Bank, Axis Bank, ICICI Bank, HDFC Bank and more. The presence of numerous ATMs all over the neighbourhood of Korattur makes life very easy for its residents. Korattur has become a prime area for both real estate sellers and home buyers due to the increasing urbanization of Chennai and its surrounding areas. Many real estate builders have built housing projects in this area. One of the most luxurious residential projects in Korattur is Casagrand Asta. This project includes beautiful 2bhk, 3bhk and 4bhk spacious apartments. These apartments also come with many amenities like a swimming pool, gymnasium, etc. The prices of real estate in Korattur are also lower compared to other parts of the city. However, they’re rapidly appreciating in value and will be a good investment decision. Korattur is slowly becoming one of Chennai’s finest developing areas, thanks to all these amenities and features which add to its beauty and quality. When you start searching for a good locality for your next home, be sure to keep Korattur in mind. Visit Casagrand for more information about our projects in Korattur and other cities.